One third of the worlds’ population is infected with Mycobacterium tuberculosis (Mtb), the causative agent of tuberculosis (TB). While the majority of Mtb-infected individuals are asymptomatic with the latent disease, millions of people present with active disease, which is one of the leading causes of death worldwide. In areas where parasitic helminth worms are endemic, the incidence of active TB is relatively high, suggesting that helminth infection exacerbates TB. Leticia Monin and colleagues at the Washington University School of Medicine used a mouse Mtb infection model to explore the relationship between helminth co-infection and Mtb manifestations. Co-infection with Schistosoma mansoni promoted fibrosis, increaed inflammation, and resulted in accumulation of arginase-1-expressing macrophages, which formed type 2 granulomas, in the lungs of in Mtb-infected mice. Treatment of co-infected animals with anti-helminth agents reduced S.mansoni burden, ameliorated inflammation, improved Th1-mediated anti-Mtb responses, and reduced disease severity. The authors infected a genetically diverse mouse cohort with Mtb alone and found that animals with severe disease also had elevated arginase-1 levels in the lungs. Evaluation of Mtb-infected patients revealed a correlation between serum levels of active arginase-1 and the extent of lung inflammation. Moreover, arginase-1 levels were highest in individulas that were also infected with helminthes. Together, these provide important insight into why TB disease rates are elevated in areas where helminthes are endemic. The accompanying image shows lung pathology of mice infected with Mtb (top row) or co-infected with Mtb and S. mansoni (bottom row). Note that co-infection increases the number of Muc5AC+ goblet cells (green, left panels), increases mucin and glycogen (PAS, middle panels), and increases collagen deposition within type 2 granulomas (Tricome, right panels). Citation Information: J Clin Invest. 2015;125(12):4699-4713. https://doi.org/10.1172/JCI77378. Parasitic helminth worms, such as Schistosoma mansoni, are endemic in regions with a high prevalence of tuberculosis (TB) among the population. Human studies suggest that helminth coinfections contribute to increased TB susceptibility and increased rates of TB reactivation. Prevailing models suggest that T helper type 2 (Th2) responses induced by helminth infection impair Th1 immune responses and thereby limit Mycobacterium tuberculosis (Mtb) control. Using a pulmonary mouse model of Mtb infection, we demonstrated that S. mansoni coinfection or immunization with S. mansoni egg antigens can reversibly impair Mtb-specific T cell responses without affecting macrophage-mediated Mtb control. 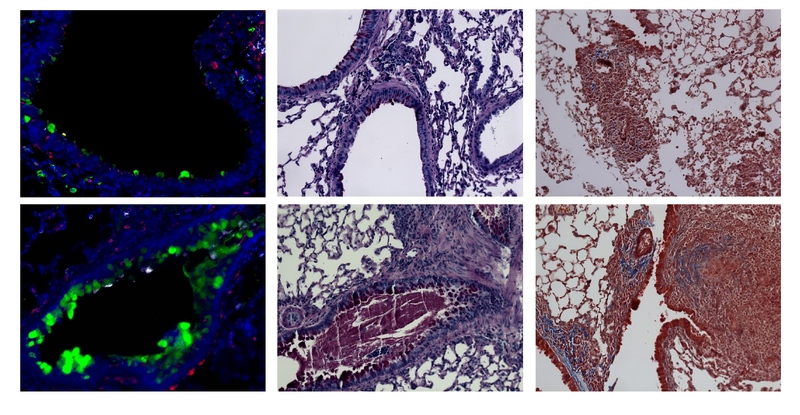 Instead, S. mansoni infection resulted in accumulation of high arginase-1–expressing macrophages in the lung, which formed type 2 granulomas and exacerbated inflammation in Mtb-infected mice. Treatment of coinfected animals with an antihelminthic improved Mtb-specific Th1 responses and reduced disease severity. In a genetically diverse mouse population infected with Mtb, enhanced arginase-1 activity was associated with increased lung inflammation. Moreover, in patients with pulmonary TB, lung damage correlated with increased serum activity of arginase-1, which was elevated in TB patients coinfected with helminths. Together, our data indicate that helminth coinfection induces arginase-1–expressing type 2 granulomas, thereby increasing inflammation and TB disease severity. These results also provide insight into the mechanisms by which helminth coinfections drive increased susceptibility, disease progression, and severity in TB.